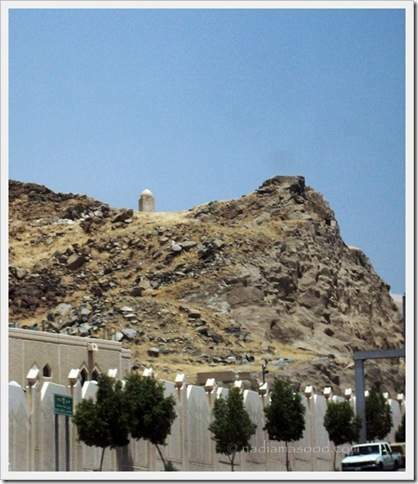 This is the spot in Arafat where prophet Mohammed (peace be upon him) delivered his last sermon to a congregation of Muslims gathered around him. Also, our guide informs us that the prophet Adam (alahis salaam) and his wife Eve asked for the Almighty’s forgiveness at this place (after being dismissed from heaven). 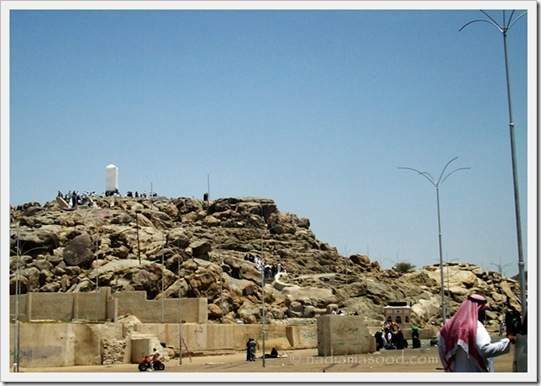 This is where the prophet Ibrahim (Abraham) offered his son, prophet Ismail (Ishmael)—may peace be upon them—as sacrifice, as commanded by Allah. At the last moment, as the prophet was about to plunge the knife into the body of his son, Allah called out to prophet Ibrahim (peace be upon him) to stop and not to harm his son. Instead, Allah provided an animal as a substitute sacrifice. And so, every year similar sacrifices are performed in memory of prophet Ibrahim’s submission to Allah. 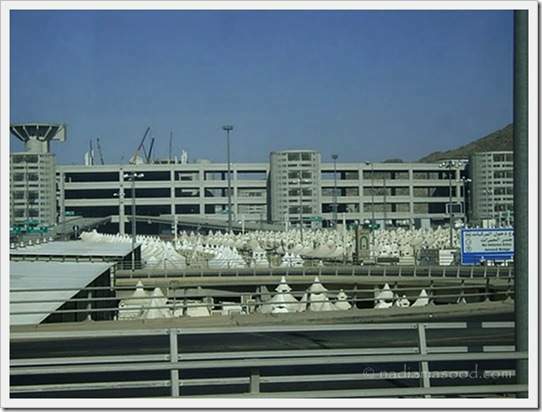 I am totally amazed by this place in Mina: the entire valley is covered with white tents. I’ve seen this countless times in dozens of photographs, but the real thing took my breath away. I try to imagine how this place might look like during the hajj season, when almost 3 million people come to stay in these tents! 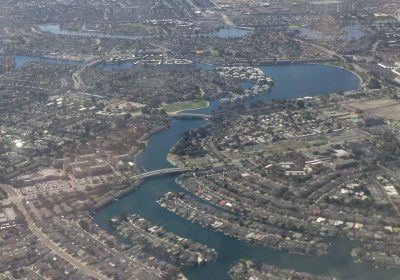 You have to see this aerial shot of the place to get an idea of the project’s vastness. 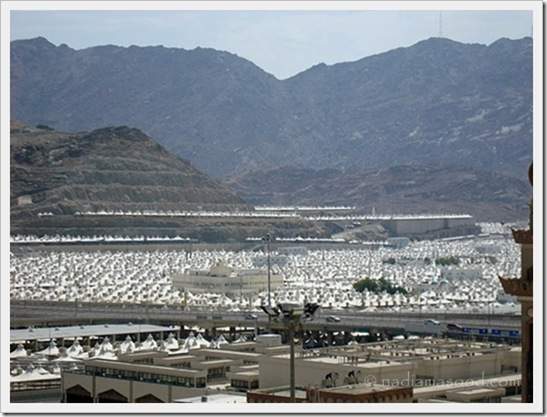 Behind the white tents are three, 85-feet long walls that represent Jamarat, or the devil. Muslim pilgrims fling pebbles at these walls as ritual acts that must be performed during Hajj. 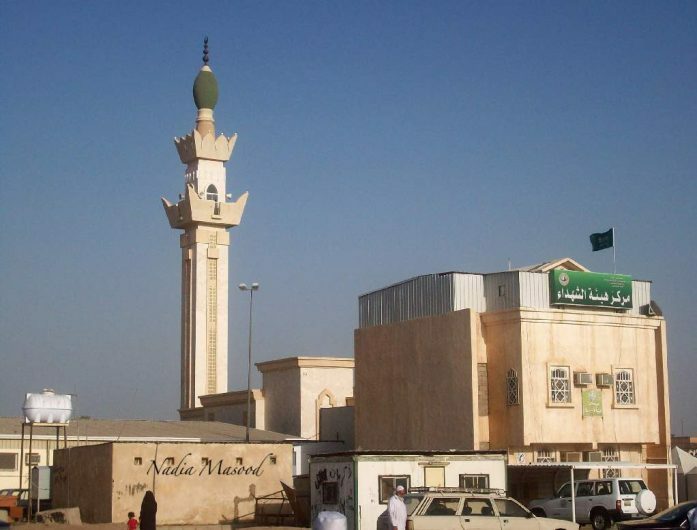 The first and largest jamarat represents the devil’s temptation of prophet Ibrahim (Abraham) against sacrificing prophet Ismail (Ishmael) – may peace be upon them. The second wall represents the devil tempting Hajar, prophet Ibrahim’s wife, inducing her to stop her husband from carrying out Allah’s order. And the third wall represents the devil’s temptation of prophet Ismail to avoid being sacrificed. Prophet Ibrahim (may peace be upon him) was ordered to throw stones to ward the devil away. He threw seven stones each time, and the devil was rebuked each time. The ritual of stoning symbolizes these rebukes. The stoning also represents repudiation of man’s self and casting aside one’s low desires. 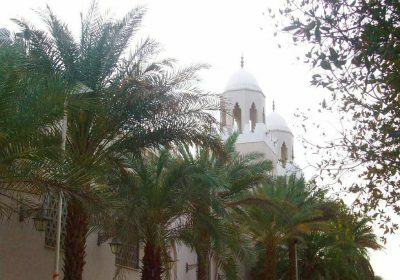 By the age of forty, prophet Mohammed (may peace be upon him) was still living among an extremely backward people who were devoid of any traces of civilization and humanity. The deplorable situation of women who were treated worse than animals, as well as the prevalence of gambling, alcoholism and murder tortured his blessed heart. He observed nothing in that society except the darkness of ignorance. When he dealt with these people as a merchant, their immoral behavior disturbed him so much that he had to go to a lonely place where he would not be tormented by people’s inhuman behavior. 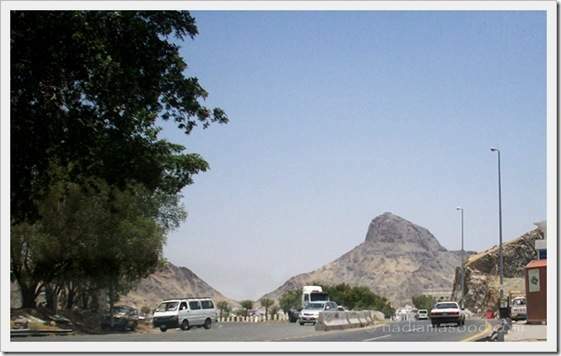 For these reasons and to find peace of mind, he would go to Mount Hira to contemplate. 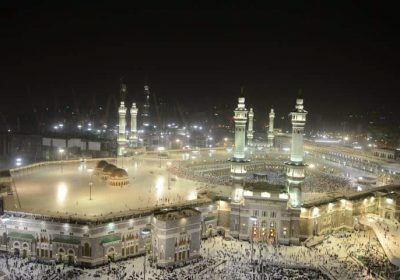 You have strengthened my desire for the Hajj with these pictures! Mezba, you’re planning for Hajj in 2012? Please make du’a for us too. We’re also planning for Hajj … maybe in 2012 too, inshaAllah. eva626, the place – despite it being desert and mountains – is indeed beautiful! Thank you for sharing the pictures! The pic of the tents is just wow. Very beautiful pics! And the aerial view of the white tents is amazing! Thank you for sharing your experience with us! You are welcome, Lat. I also find the Mina Tents simply amazing. Thank you so much, dpsa! How did u manage to take pictures!!! they dont allow 😮 ! Pervisha, they do allow photography at these sights. This post makes me want to visit your route if I’d be able/ allowed, being Biblical too. Welcome to the blog, Beverly! 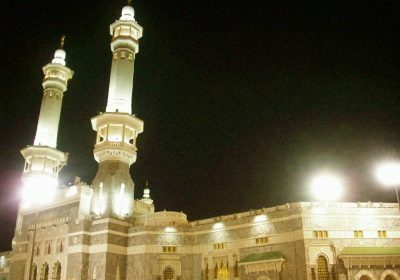 Non-Muslims aren’t permitted at these places, so I am sharing the photographs instead so that everyone sees how the cities of Makkah and Madinah are like. The city of tents is always a stunning sight. It surely is, Smiley! The way they have organized the entire place is absolutely brilliant. May Allah grant you and your family the opportunity to perform hajj and umrah soon. Wonderful! I am glad and happy you had a chance to go again. 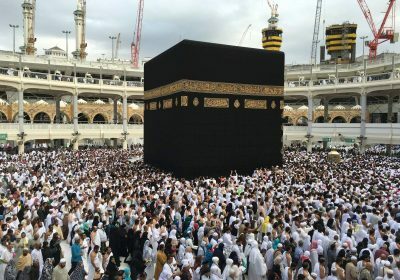 Hope you made dua for everyone who hold the desire to touch the velvet cloth of Ka’aba! Hello Behbood. How are you? Yep, one entire tawaaf was dedicated to prayers for all the Muslims to be granted the opportunity of hajj and umrah. May the Almighty answer our prayers soon. Ameen. Hi Nadia… I’ve learnt so much from just two blog posts – thank you for sharing! God is one, and he is Great, he is every where.